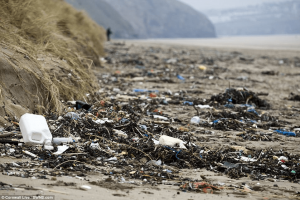 Being an island, England has a major interest in the matter of plastic pollution. Coastal areas are directly concerned by the plastic problem, so they are aware of it. Municipalities organize clean ups to protect the coasts and keep their landscape clean to attract tourists. But it’s not a hundred percent efficient,as a lot of other areas are not covered. And sea side needs a constant attention that can’t always be possible since detritus constantly wash ashore. In consequence, environment friendly people volunteer to clean up the beaches and sea side as well. Since 2014, the non profit organization that goes by the name #2minutebeachclean tries to make progress on the coast plastic pollution problem. The principle is simple : 2 minutes is nothing. But if people consecrate those 2 minutes per day to collect trash by the seaside, it can make a change. At the origin, it was localized in England. Since then, it became worldwide, as people from all across the world have gotten involved. Just recently on December 31th 2018, Steve Trewhella (wildlife photographer and author, involved in the protection of the environment) reunited 12 others people to organize a detritus collection. In one day, they picked-up a thousand kilos of trash at Lulworth Cove, on the Jurassic Coast in Dorset. Plastic trash don’t spare any coast, everything gets polluted whether it’s wild coast or touristic beaches. The problem in the case of Lulworth Cove, in addition to the visual problem and the pollution of the coast, is that this is a world’s heritage site, and is registered as a UNESCO protected site. Furthermore, it has a very important wildlife and flora. And among the trash collected, there were oil drums. If their content had leaked, it could have had serious consequences on the area ecosystem. In the beginning of January 2018, the Eleanor storm raised once again awareness on plastic pollution. The consequence of this meteorological event was to find the plastic trash in the UK water wash ashore. Beaches and coastal areas found themselves covered in trash, most of it being plastic. While it was hidden in the sea for no one to see it, the storm brought to attention that even though you can’t see a problem, it doesn’t mean the problem doesn’t exists. In January 2018, the European Commission announced the launch of a global strategy to protect the planet from plastic pollution. May the 10th 2018, new rules were proposed to reduce the presence of the 10 most commonly found plastic trash in the oceans. This decision comes from the fact it is now well known that the oceans are polluted. The numbers are obviously alarming. The 7th continent speaks for itself ! Ocean CleanUp revealed in march 2018 that it is now 1.6 millions square meters, and is made of 80 000 tons of plastic trash. At a global scale, ocean trash are 85% plastic, among which 27% are fishing equipment’s. As for the way those garbage came to be there, ⅘ of it comes from land. It is thrown on land and then carried by water streams to the oceans. The ⅕ left was thrown directly into the water. An even more alarming fact is that every second, 250 kg of plastic is being poured in the sea. This situation is now a major concern for the European Commission, which role is to submit bills to the Council of the European Union and to European Parliament. And also to watch after the application of the laws. Some actions were instilled to limit the plastic pollution of the ocean, and to bring awareness to the public, without flagrant success. This is the reason why the European Commission wishes to make this a priority. In 2015, France prohibited the use of single use plastic bags. In the UK, a 5p charge was established (with the effect of its sales dropping by 86% !). Plastic has an awful impact on the environment, but animals suffer from it too : sea animals swallow it, and get trapped in it. If nothing is done, there will be more plastic than fishes in the oceans in 2050. The humongous quantities of plastic thrown in the sea doesn’t seem to be match by the ones we see. There is a reason to it : according to Alexandra Ter Halle, researcher at the Toulouse III University, plastic disintegrate itself in thousands of microscopic particles. These particles liberate toxic materials, and can be found anywhere related to sea life : in the water, in the animals that eat it, and thus inside our food ! Plastic pollution is not just an environmental issue, but also a health one. These products will be prohibited, as they can easily be replaced by eco-friendly alternatives. Another objective of the European Commission is to recycle 90% of the plastic bottles in EU by 2025. But before the setting up of these measures, they have to be validated by the Council of the European Union and the European Parliament. In order to make concrete actions before the European Elections in may 2019, when the new European congressman will be elected.